This review is somewhat different from "In the Spotlight"'s norm -- reason being that the Bushnell's season opener of "Miss Saigon" is nearly like all of the other "Miss Saigons" previously seen at this venue, in Boston, and in New York. ITS' website archives do not include these earlier reviews because they originate from our print-media days. Let this critic and the readers quickly proceed to the "givens" and then focus on the smaller gems. The plot is "Madame Butterfly." The set is the dark, war-torn dregs of 1970's Vietnam. The voices of the two lovers (Manna Nichols' Kim and Charlie Brady' Chris) are exquisite and strong. They are a physically beautiful duo. The third lead (the Pimp of Saigon called "The Engineer" portrayed by Orville Mendoza) is as slimy a conman as they come. The actor doesn't need a melodic voice, but one befitting his smarminess. 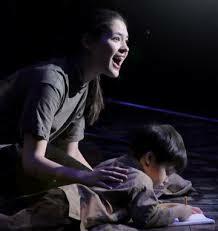 All of these vital elements lay in this current "Miss Saigon." No one will be disappointed. Then, there are other necessary elements which serve to make this musical seemingly eternal. Although termed "minor roles," the words denigrate the importance and talent of the full cast. For example, Meggie Cansler's Ellen (the wife back home) delivers a poignant "Now That I've Seen Her" to bring tears to audience members' eyes. While many are familiar with the lovely "Why G-d Why?" and "Last Night of the World" duets by Kim and Chris, Ellen's song with Kim, "I Still Believe," is a standout. Nkrumah Gatling's John (Chris' Army buddy) wallops a wrenching "Bui-Doi," accompanied by video of abandoned Amer-Asian children. Now, for everything else, those details which usually go unnoticed to an average audience when done so perfectly. The choreography of Vietnamese soldiers shows creativity unexpected in war scenes. The attempted escape scene by Kim and others, barricaded by turning gates connoting both sides of the walls to freedom, is masterful. The klieg lights and flashes in pitch dark envelop the horror of humans and geography. Beat the drums for the pit orchestra (conductor Kevin Stites), especially those on jungle-like percussion. With all of the perfect people and pieces going for it, the helicopter is really unnecessary in an outstanding "Miss Saigon."